A concrete5 site sends emails to let users (yourself and others) get the information they need. Common examples include results from your site's forms, password reset notifications, etc. To do so, concrete5 must interact with an email server. The Dashboard's Email page lets you specify whether or not to use the default email settings for your hosting envrironment, or use an externally-hosted email server instead. 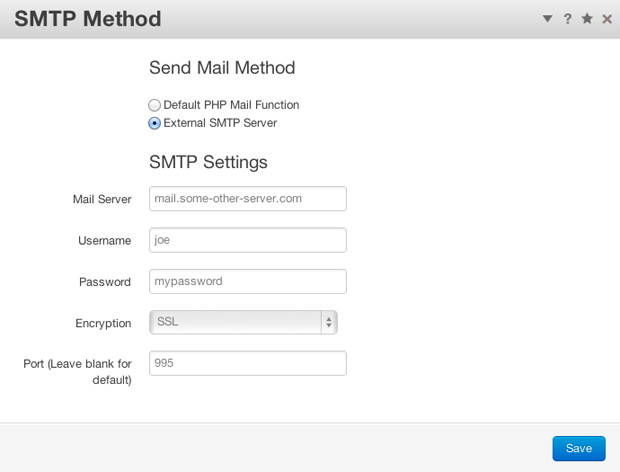 Selecting "External SMTP Server" allows your site to send email via service that is not located on the same server that hosts your site. For more on setting up your site to use external mail servers, check out this how-to article: My site isn't sending email!